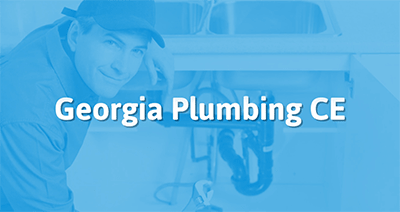 Our Georgia plumbing continuing education courses are approved by the state to satisfy your continuing education requirements. Take the continuing education to renew your GA plumbers license today. All of our courses can be completed At Your Pace Online to help you meet the state's requirements to maintain your license. Once you finish your class you will have an official certificate of completion to save for your records. Master and Journeyman Plumbing Contractors must obtain 8 hours of continuing education every two years before license renewal on November 30th, of even-numbered years. Courses may be in the areas of plumbing installation, design, state codes (such as the UPC), products, innovations or new techniques, tools and materials, safety, work related legal issues, and environment or business issues.